Home / Brain Hacks / How X Rated Are Your Thoughts? How X Rated Are Your Thoughts? You know that saying “You are what you eat” it’s the same for your mind, you get out of it what you put into it. Along with every other thought that you process daily, your early programming also filters to the surface of the mind from time to time and some might say there’s not a lot that can be done about that. Not me though, I know it’s possible to swamp early negative messages with positive programming. That’s what hypnotherapy has practiced for years and science now calls neuroplasticity! Don’t watch things you wouldn’t want a child to see. 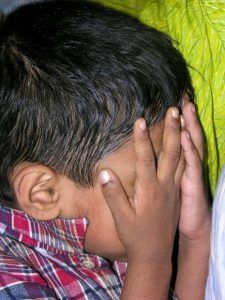 If you doubt that the mind is adversely affected by what you watch, ask yourself if you would allow a child to watch it if the answer is no, why do that to yourself? Same goes for your reading material. If you would like a quieter mind and a deeper sense of peace in your life, be discerning about what you put into your mind. Your senses are there as filters. The more rubbish you watch the more desensitised you become to it! I was on the train going into London recently and was alarmed to see a carriage load of commuters in trance! Most were reading and digesting the same free newspapers, full of negative scaremongering stories. That’s mass hypnosis for heavens sake! You can frighten yourself to death by watching a diet of scary images and I don’t just mean films, I’m talking the soaps and live reality shows that feature hospital dramas, police chases and all manner of other negative life experiences. Or you can choose to watch and read things that are motivating, uplifting and inspiring. Practice and choose because it all belongs to you! Up for a challenge? 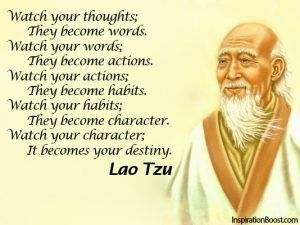 Just for today, watch what you put into your mind as the founder of Taoism Lao Tzu says ..